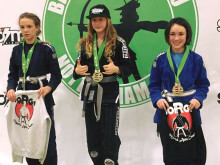 An eleven year old girl from Hereford, Dali Hopkins, has been named the top junior BJJ athlete in the UK by the UK Brazilian Jiu Jitsu Association (UKBJJA). 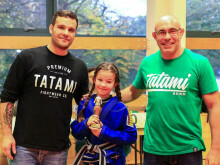 Dali not only topped the grey belt rankings this year with a string of impressive performances in competition and was crowned champion in the local Welsh Kids BJJ League, but was also the top-ranked junior overall across all belts, ages and weights. 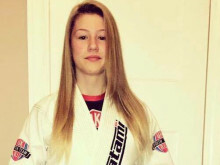 The reward for her success is a free BJJ gi, free entry to all UKBJJA ranked events in 2016, and a fund of £300 from the UKBJJA to attend international competitions. 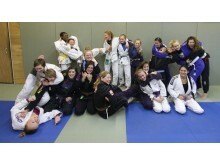 Dali, who trains at The Combat Academy in Hereford, has been practising BJJ for 3 years. Despite her young age she has racked up numerous successes and competes at nearly every competition in the UK and Europe. 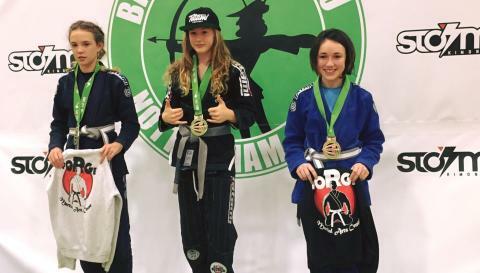 Sponsored by BJJ fight-wear company Tatami, Dali is not only British and European champion, but took gold at the Kids Pan American Championships in California. 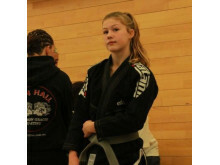 The eleven year old will be going again next year with the support of her sponsors and the UKBJJA, as well as being named as one of a UK Youth Team, a non-UKBJJA private initiative which arranges regular training sessions for juniors. Dali also competes regularly at the Kids Leagues, monthly events run for junior competitors across the country under the auspices of the UKBJJA, the sport's governing body elect. Her success has attracted the sponsorship of local businesses such as Seating Contacts, Hereford Carpets, JMART, S&T Roofing Ltd and POINT4, who want to support the Hereford athlete. 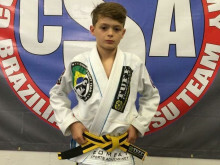 With the aim of encouraging and rewarding young talented athletes like Dali, the UKBJJA has developed a ranking system which recognises the top junior BJJ players. This includes large national competitions as well local kids leagues. 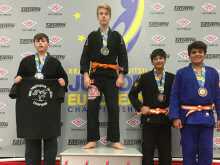 The aim of these regional events is to promote BJJ at grass roots level by giving children and teenagers regular, relaxed and well-organised competitions every month, in a safe environment with experienced referees, while the big events in the calendar such as the British and English Open allow children to test themselves against the best competitors in the UK. But it's not all about competing. Having fun and making friends is all part of the experience. Even after a fiercely fought final at the English Open this year with Nia Blackman, the girls could put competition rivalry aside. 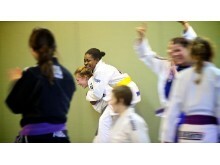 Referee Sarah Merriner remarked: "Best thing, later, it did not matter who had won. They were hanging out discussing techniques." Dali will be taking a break from competition over Christmas but will be flying out to California in February to compete once more for gold against the best juniors in the world.